Ho-Chunks gathered at Red Banks for a reconciliation of past injustices since Jean Nicolet first landed on the shore in 1634. Since that time, waves of armies came through Ho-Chunk territory removing cultural identity and natural resources. The ceremony was held at the Ho-Chunk Nation property near the Red Banks on May 4. Joining the Ho-Chunk was Steven and Rene Springer, the co-founders of Global Presence Ministries from Madison. Along with tribal members Sheridan Cloud, Pam Wilbur, and Traditional Chief Clayton Winneshiek, Springer organized the reconciliation ceremony. Cloud met Springer at a Globel Presence Ministries event in Madison last October, where he was told of Springer’s vision. They asked if the Ho-Chunk Nation would be open to them coming to ask for forgiveness and repenting of the atrocities inflicted upon the Ho-Chunk Nation, he said. “I said I believe the current leadership would be open to the idea. I talked with Chief Clayton Winneshiek, President Wilfrid Cleveland, and Legislators,” Cloud said. Springer provided apostolic oversight to regional churches and prophetic worship and prayer. That was the reason to organize this day of reconciliation, restoration, and forgiveness. Not only is Red Banks historically important as the site of first contact with Europeans to Ho-Chunk territory, it’s the site spoke of in the Ho-Chunk origin story. Springer was told about the origin story of the Ho-Chunk. “The Creator actually placed the Ho-Chunk on the Red Banks,” Springer said. Chief Winneshiek shared his thoughts on the occasion. “We’ve lost a lot. I want the best for all the people here,” Winneshiek said. Springer believes restoration is coming. “We just want to reconcile and extend our apologies for the way that our ancestors, our forefathers, treated the Ho-Chunk Nation,” Springer said. Springer shared 2 Chronicles 7:14. In a gesture of restoration, Springer asked non-native veterans to remove and replace Chief Winneshiek’s headdress, just as he had seen in his vision. “We are honoring you, and replacing your identity back upon you,” Springer said. Cloud referred to the book of Romans 8 when he addressed the people. “God let us know that the innocent blood shed was still crying out from the Red Banks. 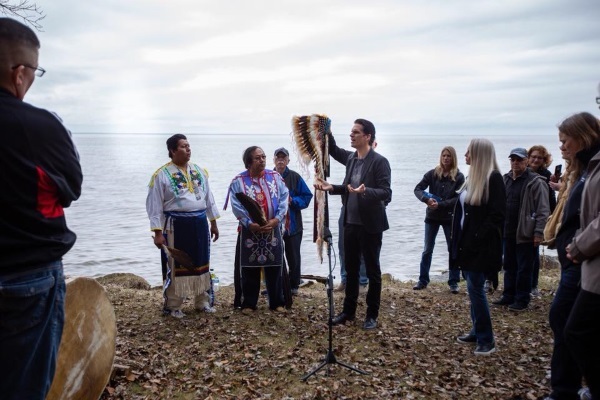 The forgiveness, extended by Chief Winneshiek and the Ho-Chunk people present, allows the land to receive healing,” Cloud said. Morris and his fellow singers proceeded to sing the “Chief’s song,” and then rendered the newly composed song. Springer presented the Chief Winneshiek with a Pendleton blanket for his participation, and together they made offerings of rice, salt, oil, and water on to the ground. Springer explained the rice represented fruitfulness. “Fruitfulness will come to the ground again. The fruitfulness is on the land. The Creator God is healing the land,” Springer said. The salt was to remove the bitterness, he said. “We believe this is going to remove the bitterness of past injustices,” Springer said. Springer said the oil represented the presence of God. “The Almighty God, the Creator, longs to saturate the land again. It will bring healing and restoration,” Springer said. Springer explained water represents the spirit of truth. “It’s watering the land. The spirit of truth wants to pour out fresh and new,” Springer said. Morris and the singers sang the “Love One Another” song as all that were present joined hand in hand during the rendering of the song. Finally, each of the Ho-Chunks offered tobacco out onto the lake.